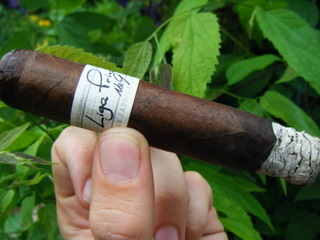 For those who are not aware of the history behind the Liga Privada No 9 - it has been the birthchild to what is now the Liga and Unico series, well... at least at the start. Drew Estate is a company that is famous for the Acid line, these cigars are infused and while they have been popular in a niche crowd, the owner or "El Jefe" was intent on creating a premium hand rolled cigar that he could smoke on a regular basis. Through different blends and attempts - the 9th or No 9 blend was the one he selected as 'his' smoke and thus, Drew Estate started creating these cigars. As all good things have a tendency to do - the word got around about how good these cigars were, they decided to create these for mass production and the rest is history. Limited production, a huge following and cigars that seem to sell out before they hit the shelves - lets see how the Liga Privada No 9 does! It is hard to say much about these cigars without sounding like you are buttering them up but honestly - they are pretty phenomenal. Even with a few decently sized veins, the head clipped like a charm, foot took flame and the burn was razor sharp from start to finish. Consistency is key and those in charge of the quality control should be very proud of themselves. Each one I had was a mirror image of the one before, tasted identical and had the perfect draw. As I said before - wish I could find something negative to offset the 'overly positive' slant but I couldn't find an issue - and I was looking for one! The taste reminded me a lot of paper was it was rounded out by a hint of leather - this wood, earth and pepper flavor slowly building in intensity. After the first 10 to 15 minutes, the wood and leather flavors started to cover my palate and built upon the base flavor profile with a sweet hit that made me question - just for a moment - if there were some 'sweet' infused flavors to go with it. The second third was as solid continuation from the first third, the wood turning into a nice light charred flavor that reminded me of a bonfire while the leather and sweet notes kept the cigar very entertaining. The last portion of this cigar ended with this charred wood and sweet leather combination but took on a nutty flavor, similar to cashews which was very pleasant as I was expecting the tars from the cigar to build up and turn the cigar sour and bitter. What a cigar! Even if you are not a fan of the Acid line from Drew Estate, this is a company that we all need to stop and take notice of. If you are on any of the Social Media outlets than you know that the company seems to be talked about every single day with the No 9 being toted as the start, the best and one of the most sought after cigars they offer. Without going on and on - buy these while you can because with their limited production, even more limited availability it is incredibly difficult to locate a box of them anywhere. The flavors, consistency and a price only found at BuyDiscountCigars.com make a box purchase a recommendation all day long.